Victor and Penny It’s a jump roots swing soul jive blues party in KC! 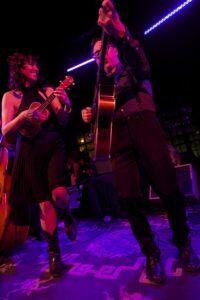 Victor & Penny play a special show with their old Kansas City pals, The Grand Marquis, as they celebrate the release of their newest CD at our favorite saloon, Knuckleheads. Brandon Phillips and The Condition wrap up the night. It’s a jump soul swing roots jive blues dance party and you’re invited! Don’t know about Fair Trade Music Streaming? Watch this little video and find out.